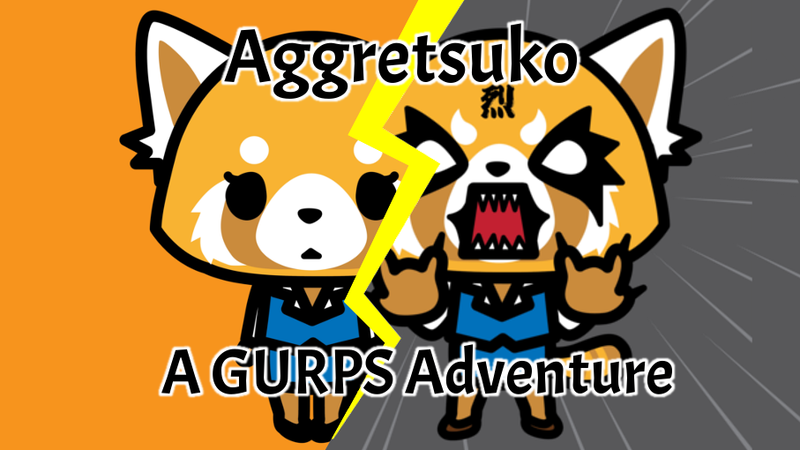 Aggretsuko (or Aggressive Retsuko) is a little anime about an ordinary Japanese accountant who has a dark secret ... she loves singing death metal! Oh, and everyone is an animal. Every day, her second goal changes. Does she need to 'Fall in love'? Or maybe she feels the need to 'Quash rumours of her pregnancy'? Whatever the goal, she must achieve these by the end of the day, or else! The game is played in five story rounds. At the beginning of each round, the GMs roll to see which of Retsuko's allies and enemies appear. Each NPC may take a single, quick contest, action (e.g. giving Retsuko more work, taking her to a mixer, etc.). This action may lead to more rolls on Retsuko's part, e.g. completing given work or impressing someone at the mixer. Life is stressful! When Retsuko fails any roll or quick contest, she gains a stress token which reduces her Will by 1. If someone wins a quick contest against her, she must immediately roll Will to not burst out into death metal screaming. If she wishes, Restuko can spend a character point to change a failure to success. In doing so, the player should narrate the way she takes it (usually heading to the bathroom and screaming to death metal). There are only 3 character points per game, so they should be used wisely! When Retsuko's stress hits 10 (i.e. Will-10) any failure automatically triggers her death metal singing. Alice and Bob decide that Ton takes the first action. He gives Retsuko an unreasonable stack of work! This is a quick contest between Ton's Intimidation (12) and Restuko's Will (14). Retsuko wins by 3 and politely takes the work without screaming. Since Alice is worried about what Bob will do, she lets Bob go next with Komiya. Komiya then tries to give Retsuko even more work but Alice steps in with Fenneko uses her action to make an excuse! 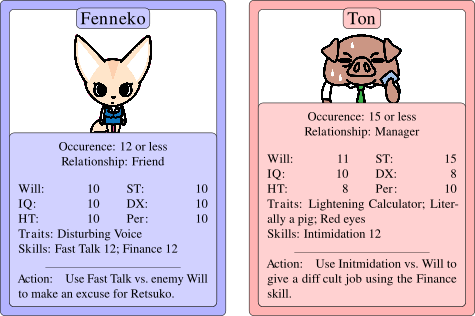 A quick contest of Fenneko's Fast Talk with Komiya's Will and Fenneko wins. Fenneko tells a tale of how Retusko has a serious doctor's appointment and couldn't possibly have more on her plate right now. Komiya believes her, so leaves Retsuko alone! Charles then rolls to see if Retsuko completes the task using Finance (12), but fails! This adds a stress token and means Retsuko's next Will roll will be at 13. A couple of rounds later, Retsuko's Will is at 10, and Kabae appears asking if it's true that Retsuko is looking for a new job. If Kabae finds out, it's only a matter of time before Ton knows. If Retsuko is going to get through today, she needs to win this. A quick contest between Kabae's Fast Talk (13) and Retsuko's Will (10), and Retsuko fails! This triggers a concentration roll not to sing ... and she fails again! WHY DO YOU KNOW HOW TO PERSUADE! YOUR STUPID HEAD LOOKS LIKE A SPADE!!! 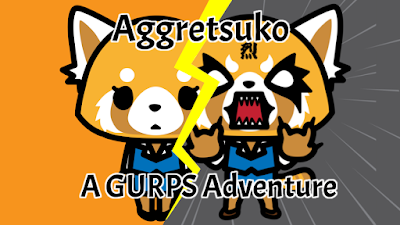 Retsuko reveals herself as a death metal singer and loses! Oh well, better luck next time Retsuko! This game is not playtested yet, so if you do play it let me know how to goes in the comments!